pasensya na mga kafatid, hanggang drawing lang ang fafa ko ngayon. my siblings and i were immediately hooked up with fushigi yuugi on its first run. for my brothers, it was the story but for me, it was tamahome. he's the typical tall-dark-handsome but a little rough on the edges and the kind of man who sticks to one woman. 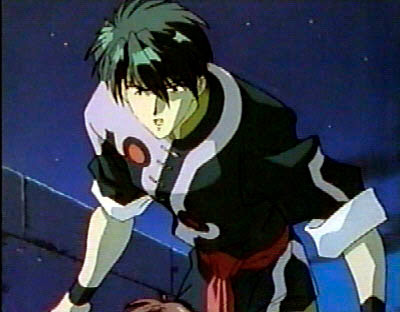 Tamahome (鬼宿) is a character in the anime and manga series Fushigi Yūgi. First portrayed as greedy and only seems to want to help out when he is paid. Of course later on in the series it is revealed that he only acts greedy for a special cause. 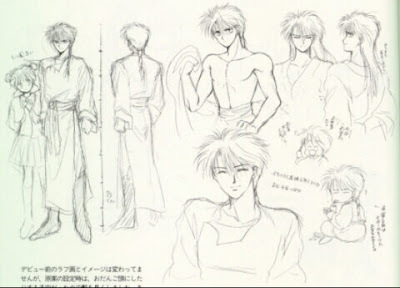 He later fell in love with Miaka after she confessed her love to him and was struck ill. He cares for all the Suzaku-seishi and is deeply wounded when some of them die. 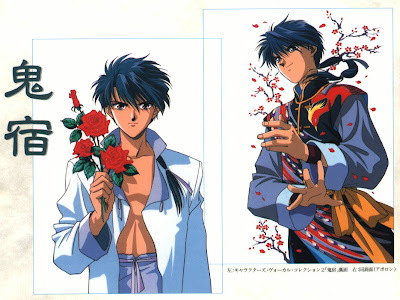 In the OVA Season 1 3rd episode, he is reborn in Miaka's world as Taka. Real Name: Sō Kishuku ~ Xong Guǐ-xiù (琮 鬼宿) Everyone knows him as Tamahome. Personality: On the outside he is very chipper, and that leads to some comic expressions. But he is tough on the inside (so he thinks). On the other hand, he is very shy. (He had to become stoic for his family's sake.) That is why he was hard on Miaka at first. He sacrifices himself for the sake of others, and won't back down against an enemy. He is in love with Miaka. Voices: Hikaru Midorikawa (Japanese), David Hayter (English), Lloyd Navera (Tagalog). fairygodflower says: ...in short xa yung tipong lalakeng di pumapatol ng bakla! charing! bitchywitch says: japanese ba xa? bka japanese din size ng kanya ha? though the dance is not queer, i have marvelled its grace and history that i have no choice but to love it. sino ba namang hindi gustong sumayaw nang nakataas ang kilay, pumipitik ang mga daliri, may pamaypay, may muchachang nagpapayong sayo at may prinsipeng sumusonod at hawak-hawak ang kanyang "sandata". Also known as the Princess Dance or the Royal Maranao Fan Dance, the dance is based on the Maguindanao and Maranao interpretation of the ancient Indian epic, the Ramayana: the Darangen. The Singkil narrates a scene in which Sita (Putri Gandingan) escapes her abductor, the demon king Ravana and is lost in the forests of Alangka, thereupon being found by her husband, Prince Rama. Interesting to note is that in the original Ramayana epic, Rama selects Hanuman, the Hindu monkey-god, to find Sita on his behalf; the fact that in the Singkil it is Rama (Rajah Bantugan) who finds her suggests a modification of the original Hindu narration in order to agree with monotheistic Islamic ideology. Kasingkil refers to the art of moving one’s feet in and out of two clicking bamboo poles in imitation of Putri Gandingan who gracefully avoided the falling trees brought about by an earthquake. Performers would therefore gracefully step in and out of bamboo poles, arranged in crisscross fashion while manipulating either fans or simply their bare hands. Played at celebrations and festivals, traditionally the dance was performed by a girl of royal blood intend on advertising herself to would-be-suitors for her future marriage. The dance is said to have been named after either the leg bracelets or anklets of silver, nickel or brass with chiming bells of the same name or the act of voluntarily or accidentally entangling on one’s feet in either vines or tall grass. fairygodflower says: bagay na bagay, sayaw pang royalty evur. bitchywitch says: fyi lang po mga kafatid, ang "sandata" na ginagamit sa singkil ay kris. meron syang curves. kayo, gusto nyo ba ng sandatang may kurbada? queer icon at war: these entries shall be about my influences. people, places, cultures, objects and everything that molded my queer self into who i am now. knight and shining armour: will be about men who forced the high school girl out of the queer me. hope you'd enjoy these posts. now, i have to head back to my tent and braid my silk, long, black hair. bitchywitch says: patayan to the highest level na itu!!! *just two corners away from our resort(kota beach). princess aries says: i think i want to meet their cook. fairygodflower says: their signboard is familiar... hmmm... kelangan makausap ang cook na yan. I wanna go home. I miss my cook. "burning the sun in bantayan"
our troop just made it to the 5 am aircon bus. lady stephanie and lady val nearly missed the trip, they had to jump on a moving bus(parang action starlets ang dalawa). give or take three hours our bus dropped us at the hagnaya port. just a few minutes after that were on our way to bantayan island via fastcraft. it took us more than 30 minutes to have our feet on the sands of bantayan. good thing we have our free transfers. our room was one the last non-aircon room of the resort since they were all fully booked(summer kaya) but it was a good room(3 out of 5 ganda points) and at a good price. even better was their beach front. unspoiled white sand without the flocks of people and their bare skin plus a natural occurring sand bar. by lunch, the troop decided on the second option. it was cheaper, it even included both island hopping and snorkeling and we were on our boat ride at two pm, on hour earlier than scheduled. the afternoon battle was fun but our bodies were sore and most of us had to sleep until past eight pm. 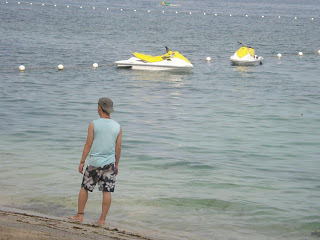 that was the time when we realized that our resort is having a brown out. thinking the whole island was out of power we decided to dine inside the camp. we placed our orders at 8:30 and had it delivered on our table after an hour. the power outage really slowed everything down and enchanted everyone to sleep. but did not want to cap the night off just like that. so armed with jose ceurvo, i called on princess nina and lady staphanie(who were the only ones awake), went to the beach and had a night of tequila, profoundness, laughter, beauty and friendship(ang taray). 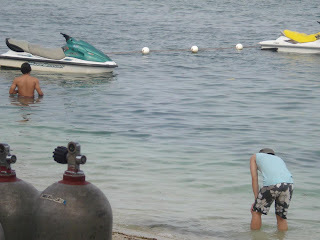 then the next day we found out that it was only our resort and the next reasort that had no power(peste). my stomach nearly bled since i woke up late with only tequila on my stomach(thank you nina for the antacid). still, we spent the rest of the morning on the sand bar and more picture taking. but something unexpected silenced my noise. 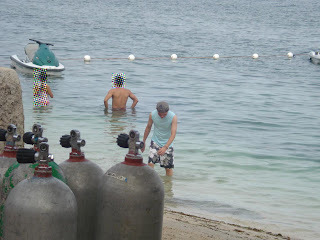 a group or alpha males were also enjoying the beach near us and one of then was...umm...(deep breathe)he was cute. then princess cathy turned to one of them and said..."amigo, pwede magpa picture?". i literally swam at the back of my companions and then giggled like torpe(*sigh the little girl in me). i was not even able to say my thanks after he took our picture. i really had to practice flirting even more. several minutes after ten in the morning we washed off and pack. there was a lot more places to go, activities to do, food to eat(and guys to hit on hehe) but so little time and it was time to leave. only "dining out at night" was considered a failed mission but all others were complete and successful, the cost and casualties were negligible, we had more fun than expected and all warriors went back safe and smiling at est. 1700 hours. 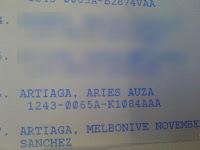 i, aries the warrior princess, swear to the most high that this document is true and authentic. bitchywitch says: ...at kelangan mabasa to ng cute na guy na pinakuha nyo ng pic! fairygodflower says: wow. fresh talaga kung fresh. bitchywitch says: pampadagdag tamod ba toh?! ayo! palita ko ice candy, tita! election at our area was generally peaceful and all in order. PADAYON PILIPINO!!! fairygodflower and bitchywitch says: kayo mga bakla, nakaboto ba kayo? leave ur opinion on the 'comment' section of this entry. salamat. fairygodflower says: ang dakilang pamintang durog. bow. bitchywitch says: baka akala mong sabihin naming kamukha mo si scofield. nagkakamali ka prinsesa. ambisyosa! a day before mother's day another object flew towards me from my mother's hands. sounds scary, doesn't it? the hands that nurtured you are the same hands that would crush your heart. i really don't want to have entries as personal as this but let me just rant this out for my sanity's sake. -dipper and pail(tabo at balde) she didn't hit me though, but she threw these at my direction and broke the dipper(may galit talagah divah). 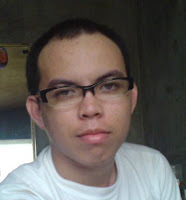 this summer i had my hair shaved (semikal lang actually kasi nga mainet). and so when i came back home for the elections my mom saw my new hair. to my shock, she was enraged by it. her claim was that i look like a criminal from prison and i was a fool to have my hair done that way. i explained my side citing the weather as my major reason and i even used words in english to stress my point. that was the time when the bananas went hurling. she said, being the mother i had no right to explain to her what is right for me because she knows best and she thinks i'm a gay fool. a few minutes after that, i broke down. i didn't saw that coming, not from my mother's mouth that is. good thing my father is always on my side. this was a day before mother's day. rewind. the dipper and pail incident was when i wore a pink patrick starfish children's tshirt on holy week and i don't want to tell you the details. i can't even figure out why she did that. aunt: why do you have to travel with your son for enrollment? i think your son is already old enough and you would just stress yourself out. i don't even go with my children on their enrollment in college. mama: i really don't trust him handling the money for the enrollment. ... and she said that in front of me. what the hell did i do to be stripped off of my mother's trust? 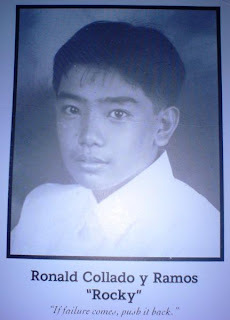 ay ewan. she probably forgot about this conversation but it came to me like a bomb. hmmm i think i've just written the reasons why i'm creating an illusion of the lady warrior seeking her mother on this blog. my love for her has probably faded but my respect is still there. belated happy mama's day mama! fairygodflower says: tawagan na natin si tita charo. bitchywitch says: mother knows best. eh pano kung ung "best" nya eh ung panahon pa ni manilyn reynes!? 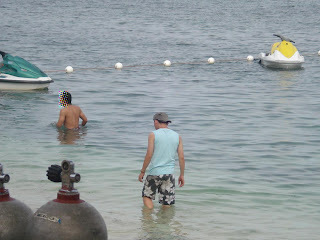 i was raised up in an island settlement called bohol... at masaya dun. pramis. but there is one thing that held me back from appreciating my childhood. the elders who brought me up were very cautious, too cautious. the princess was never allowed to go out on any travel. the princess was never allowed to see this group of people. the princess was only allowed to do this and that. it was not a bad, though, but it was not also good. di pa ako nakakita ng Tarsier!!! di pa ako nakapuntang Chocolate Hills!!! di ako marunong magsalita ng pa-Bakla!!! bitchywitch says: buti pa aketch, sight ko always mga tarsiers every night. fairygodflower says: gaga, hindi kaya tarsier yon. nota yon, bakla! The hardest part was admitting that I'd let myself go way farther than I wanted to. today you will witness the princess as she executes an act that might lead to her fatal end. the princess will attempt to gather data on a subject. in warfare, this is called espionage or spying. soldiers, observe! *ay amputa, haggard ng fez. feel ko man mga hunky daddy pro di ko feel mga hipon na daddy! leche!!! yun na ang data! i, aries the warrior princess with all my humility, pledge allegiance to the alliance of queer warriors. as a warrior princess, i will perform my duties to protect and carry out the idealism of the alliance, to respect my queer allies and to dedicate my life to world peace. may the spirits of the earth bless and protect us always. bitchywitch says: galing ng pinoy gay blogs. inuman na to mga pare!!! in my previous entries, it has been evident that one of my servants is falling for rocky collado of the bloomfields the musical warriors, while the other one is just lusting on him. in this entry i shall give space to one of my servant to yell her heart out. 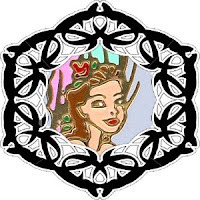 fairygodflower says: magandang araw po sa inyong lahat at salamat your highness for the space. to all the creatures, domestic and wild, i am the fairy of the earth and it is in my nature to admire music in any form that this magical world creates. a few days ago, i laid my eyes on the most impressive musical warriors since ever. to complicate things even more, one of them swept my fairy heart away. ..rocky sinasamba kitah, ang galing, galing, galing, galing moooooh... and so to you rocky i just want to say... pare, ang cute mo talaga, pakiss nman dyan! princess aries says: pabayaan mo na yan iha. once in a blue moon lang ganyan yan. well whatever they say, the BF have one less person to worry. the princess is now a fan. they are now my bf and they can call me their gf, if it pleases them. from now on i shall call them Bloomfields the Musical Warriors. as to the fans of The BF, let's see the powers of their music and performance. ladies and gentlemen, the grooviest combo in today's music scene... the bloomfields!!! kung gusto nyo makita si rocky in his drumming frenzy na parang naka ecstacy(lol) in 5 minutes straight, watch nyo to. bitchywitch says: galing naman. sana akong pinupokpok ni rocky. pokpokin mo akoh. ipokpok mo, ipokpok mo!!! pahinga muna sa english dahil super saya ko ngayon. nakita ko na ang bf ko!!! ahahaha masaya davah?! at ano pang mas masaya? lima sila wahahaaay masayang masaya ang prinsesa! sheryowslee, kaka download ko lng ng ilang songs ng 'the bloomfields'(or "The BF"). feel ko kasisimula pa lng ng mga fafang ito at sana kumagat sa masa ung music nila. the beatles at apo hiking ung mga tinitira nila kaya vintage ang flavor at may costume pa! di lang yan mga dalaga, may sobrang cute sa members nila. si rocky collado on drums and vocals. 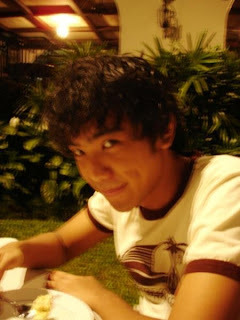 haller, matutunaw ka sa dimples nya!!! oh eto sila. buy na tayo ng album nila. support tayo sa pinoy bands, pinoy music at pinoy men. charing!!! patrons of the arts were thrilled to have the scrolls performed on stage and so they did. but a very sad news was delivered to me. they were only to play it in the capital city. the play is on its 5th run now, i've heard, but its purpose of entertainment didn't reach any settlements or villages near my war camp. very sad indeed. and so i shall shout my fiercest war cry evahh: DALHIN NYO YAN DITO SA CEBU!!! AKALA NYO WALANG BAKLA DITO??? AKALA NYO LANG WALA, PERO MERON, MERON MERON!!!!!!! bitchywitch says: eh kung tayo nlng kaya ang gagawa ng play na yan. i'd really like to do queen femina's part.